Every once in a while, individual athletes defy the odds and somehow find a way to outperform expectations which already seemed overly ambitious to the impartial observer. Irrational optimism has long been a staple of the college football landscape. Nothing can stop the average college football fan from believing in their heart of hearts that their team will have a special season prior to the beginning of the year. Not even the mathematical certainty that only 50% of game participants on the season will emerge victorious will keep fans from thinking that their team is somehow immune to the laws of probability. Due to the very nature of an unreasonably optimistic set of fans, a perceived notion of underachievement is another common quality found throughout college football fan bases, as teams and athletes become victims of impossibly high standards and expectations. Every once in a while, however, individual athletes defy the odds and somehow find a way to outperform expectations which already seemed overly ambitious to the impartial observer. Last year’s Heisman Trophy winner, Johnny Manziel, is a prime example. Prior to the start of the 2012 season, diehard Texas A&M supporters undoubtedly had loftier expectations for their quarterback than the casual fan who had never heard of the man we now know as “Johnny Football”. Even so, it is highly unlikely that even the most passionate Aggies supporter could have seen Manziel going on to become the first freshman in college football history to bring home the sport’s most prestigious individual honor. Heading into 2013, an abundance of hyperboles and exaggerations once again flooded the college football world. One of the common discussion points this offseason which almost assuredly seemed doomed to end up in the “overly ambitious” category was the prevailing sentiment that Florida State freshman quarterback Jameis Winston would emerge as a potential Heisman contender by season’s end. Even with the success of Manziel still fresh on the minds of college football fans, Texas A&M’s controversial signal caller was the rare exception to the longstanding rule that freshman quarterbacks struggle at the collegiate level. Winston, it appeared from an outsider’s perspective, was destined for a perceptually disappointing season due to the fact that Manziel had raised the standard for freshman signal callers. 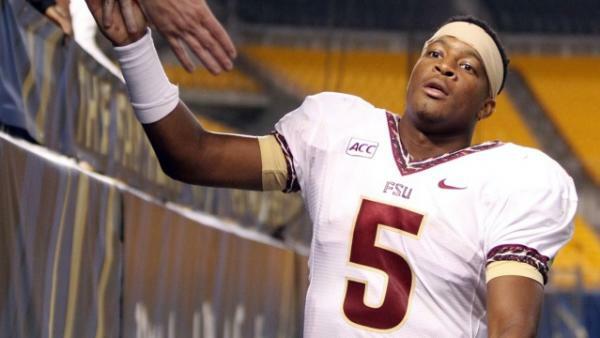 As we have seen just a handful of times in college football history, though, the unreasonably immense expectations set for Winston before his first collegiate start proved to be not quite high enough. Starting his first contest in a hostile road environment against a conference foe, Winston completed 25-of-27 passes for 356 yards, four touchdowns and no interceptions. He also added 26 yards and an additional score on the ground. Statistically speaking, it was one of the greatest debut performances from a quarterback in history. Even for a former Florida State quarterback like Super Bowl winner Brad Johnson, such a tremendous debut from Winston was both impressive and astonishing. A two-sport star coming out of high school in Alabama, lack of physical tools was never a legitimate concern for Winston. In addition to being ranked as a five-star quarterback prospect in the class of 2012, he was also considered to be a top prospect for the Major League Baseball Draft at the age of 18. Winston was given a first round draft grade by many professional baseball scouts, but ultimately fell to the 15th round because he had already publically announced that he would postpone a potential baseball career in order to pursue college football. His elite physical tools are evident and are a tremendous attribute, but they are not what separate Winston from the typical freshman quarterback. Through the years, we have seen college newcomers step in under center and display amazing arm strength or exceptional scrambling skills. What we have not seen is such a young signal caller step in and immediately take command of an offense with the poise and intelligence of Winston. Naturally, one solid performance, spectacular as it may be, neither makes a career nor justifies an incredible level of hype. But based on all of the things we have seen from Winston and heard about him from his coaches and teammates, maybe it is time to reevaluate our expectations of Florida State’s signal caller. Believe it or not, Winston very well may be even better than we all initially thought.